Our lathe is finally getting some good use! 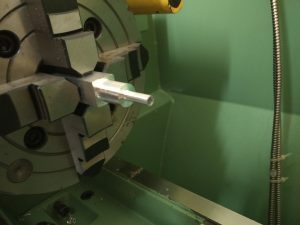 This time, a small part was made from aluminium, a coupling for connecting two pieces of tubing for the water cooling system in the upcoming CNC router project. 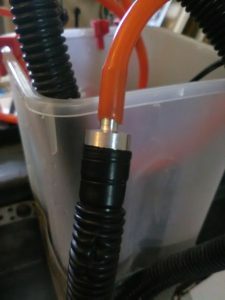 It will replace the existing temporary hose-and-clamps hack. A piece of bar stock was clamped in a 4 jaw chuck, made into a cylinder and turned down to about 16mm diameter. Next we turned half of it down to about 6mm and drilled a 4.5mm hole through it, using a drill chuck. Lastly we smoothed the edges slightly and parted the whole thing off. The end result is more f unctional and looks a lot better! The whole operation went smoothly in overall retrospection. However, we had few small issues to deal with on the way. Firstly, it wasn’t obvious how to set gearing for the power feed, as the manual wasn’t very clear. Another problem was that the square shape of stock, required the use of a 4 jaw chuck, which is not self-centring. That adds a couple of extra steps to set up, as centring of the stock has to be done manually in such a case. This was written by kfoltman. Posted on Monday, August 22, 2016, at 9:57 pm. Filed under Project, Space, Tools. Tagged lathe. Bookmark the permalink. Follow comments here with the RSS feed. Post a comment or leave a trackback.